We have successfully registered as household employers in all government agencies - SSS, Philhealth and HDMF or Pag-ibig, our household helpers now have their SSS, Philhealth and HDMF numbers and we have paid our contributions for the months of July and August. We are just lucky that the husband had time to line up in SSS and Philhealth and I asked a favor from someone who was going to HDMF. The husband told me the queue in HDMF was the worst. Someone said it was because payment of contributions are also coursed through the HDMF office and not through banks or other payment centers. The government imposed an additional burden on us who employ household helpers. The least they can do is to make compliance less burdensome for us working class who don't have the luxury to take weekdays off. I think I have earned the right to complain. We hire helpers because we don't have the luxury of time. Every precious minute counts. It is the hard truth for parents like us whose days are filled to the brim with work to dos and family obligations. Not to mention that the very bad traffic we have to brave through every day eats a substantial amount of our time. The government does not have the right to enforce red tape on us on a monthly basis. I haven't had the time and patience to call SSS to follow up on the status of the application for auto-debit arrangement I submitted to BPI last August 19. It has been a month since. One tip to save on time (although this could affect budget and cash flows) is to make quarterly advance payments. Someone said this is doable. I did this for our Pag-ibig contributions. I already paid for July to September. And still, there's no word on the Unified Registration System that was supposed to be rolled out two weeks from August 9. Forgive the rants, I am not feeling well. Next to worry about are the quarterly postings. Nonetheless, compliance is compliance. For the love of our household helpers! There was a time a long time ago when the mere mention of Manila Zoo made me feel giddy with excitement. I have committed to memory a childhood picture where I was happily posing in front of a peacock pheasant. Simple joy! I hail from the province and a trip to Manila used to be so special. What I didn't realize until I had children is that I was lucky to have grown up a probinsyana - to have the fields, vast expanse of free space and hills as my playground. To have flowers to pluck, leaves to gather, dragonflies to catch, trees to climb, free fresh fruits to eat. My kids aren't as lucky. That's why a trip close to nature is a treat for our children. We brought the kids to Manila Zoo yesterday, as reward to our pre-schooler for winning the Interbranch science quiz bee in school. 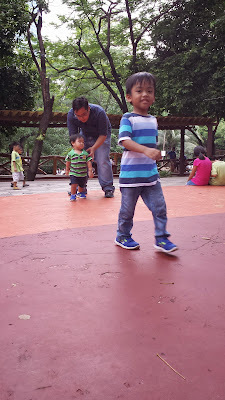 He loves animals and was happy to see the elephant, the birds, the tigers and the crocodiles. He was indifferent to the smell and the dilapidated look of the zoo. vision board: off to Paris! This weekend, the husband was looking at his vision board and pointed to a picture of the Eiffel Tower. Husband (with much conviction): I am going here! TL#1: Oh, you're going to Paris, France. Mommy has been there. Then the husband went downstairs. TL#1 (very puzzled when he saw the husband): Daddy, you're here?! Husband (looking up nonchalantly from his iPad): Yes. TL#1: Huh, I thought you went to Paris. Why are you here?!? Speaking of vision board, I would want to make my own, too. It has been a while since I set goals for myself. Through our example, we hope that our son will learn to practice the value of goal-setting at an early age. If you want to make your own vision board, Martha Beck has guidelines here. Malapit nang matapos ang Buwan ng Wikang Pambansa. At bilang paggunita sa kahalagahan ng pagmamahal sa sarili nating wika ay tatanghalin ang isang paligsahan sa eskwelahan ng aming panganay na anak.